Born in 1965, he got the Organ and Organ Composition and Cembalo Diplomas at the “E.R. Duni” Music Conservatory of Matera, where he studied Piano and Composition too. He obtained in the same Music Conservatory the Orchestral Conduction Degree in 2007. He followed Organ improvement courses with Endre Viragh, Luigi Celeghin and Klemens Scnorr and Choral Conduction courses with Bruno Zagni. He performed many concerts as Organist, Cembalist, Orchestra and Choir Conductor. He realized, as Organist, two tours in collaboration with the Saarland University Choir and with the Bonner Bach-Chor (conductor: Jürgen Böhme). He recorded, as Vocal-Ensemble Conductor, the CD “Autori Lucani tra ‘800 e ‘900” realized by Ensemble Gabrieli and Regione Basilicata. He recorded as Orchestral Conductor, the CD “Weke” (Velut Luna). Catenazzo collaborated, as Choir Preparer, with the Potenza Lyric Choir, with Maestro Luis Bacalov and the Orchestra ICO della Magna Grecia. He directed the same Orchestra in the “Requiem KV626” by W.A. Mozart. He collaborated with Festival Latilla, Casamassima (Ba), where he conducted the Operas “La Finta Cameriera” (G. Latilla), “Il Filosofo di Campagna” (B. Galuppi), “La Cambiale di Matrimonio” and “Signor Bruschino” (G. Rossini). On May, 2012, he performed as Cembalist with the “Duni” Conservatory Chamber Orchestra at the New York “Carnegie Hall” (conductor: Daniele Belardinelli). On September, 2012, he performed as Choir and Orchestra Conductor the “Sinfonia Eucaristica” by A. Pierucci World Premiere, live tv on 17 channels from the Garden of Getsemani (Jerusalem), conducting the Duni Music Conservatory Choir and Orchestra. The “Sinfonia Eucaristica” has been replyed in Geneve (United Nations), Milano (Cathedral), Matera (San Pietro Caveoso). With the same orchestra he played in april 2014 at the KMS of the Berliner Philarmonie (D), (conductor: Fausto Fungaroli). 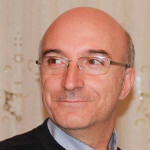 Catenazzo was a Juror at VII “Rimini Choral” International Choir Competition (2013) and IX Festival Della Coralità veneta (2016). He performed in april 2015, as solo organ, the 3rd Symphony in c minor op. 78 by C. Saint-Saëns, with the Orchestra I.C.O. della Magna Grecia (conductor: Oleg Caetani). He collaborated, with his Choir Polifonica Materana Pierluigi da Palestrina, with the Maestri Piero Bellugi, Nicola Samale, Vincenzo Perrone, Nicola Ventrella, Vito Clemente, Jürgen Böhme, Luis Bacalov e Rino Marrone. He is Artistic Director of the Polifonica Materana “Pierluigi da Palestrina” and conductor of the choir since about 30 years. With this choir he realized three CCDD: “Ecce Lignum”, a collection inspired to the Passion of the Christ, “Cor Amore” and “Contemporanea”, two live collection, the second one dedicated to contemporary authors.. He performed with the Choir during some TV programs (RAI3, Rete4, TV2000). He recorded with the same Choir eight episodes of the TV program “Nel Cuore della Domenica” for the TV broadcasting station TV2000. Catenazzo works as editor and copyer, too. He followed the critical revision of the Operas: “La finta Cameriera” by Gaetano Latilla, which he also conducted as Modern Premiere; “Catone in Utica” and “Nerone” by Egidio Romualdo Duni, on request of the Festival Duni and Basilicata University. He is teacher and vice-director at the “Egidio Romualdo Duni” Music Conservatory of Matera. He is the Artistic Director of “Petra Matrix” Choral Festival and “Antonio Guanti” International Choir Competition.